If Britain votes to leave the EU, what will it mean for the two million British expats living on the Continent - and the further one million who own a holiday home there? Could taxes, mortgages and visa requirements change? Would they have the same freedom of movement as non-EU citizens? 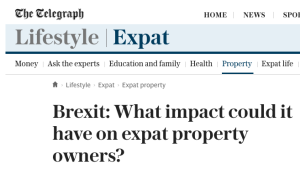 A recent survey by A Place in the Sun, the overseas property media brand, showed that 90 per cent of UK overseas property owners are unsure how Brexit would affect them. More than four in ten admit they are concerned about the situation - although seven in ten reported that leaving the EU would not prevent or postpone them from buying an overseas property. The simple answer is even if Europe felt snubbed if we voted to leave, it's highly unlikely that UK citizens would be penalised. British expats, including pensioners who receive a UK income, provide a massive contribution to the local economies of their chosen countries and generate considerable tax revenues, said Richard Way, editor at OverseasGuidesCompany.com. The tax situation would remain the same as there are bilateral tax agreements between the UK and other European countries that have nothing to do with EU rules and even local taxes should remain the same. UK tax hikes affecting expat property owners: is it too late to act? Local tax treatment tends to be based on residence rather than citizenship, so the key factor would remain how long the property owner stays at the property, rather than whether they come from an EU member state or not, explained Tim Walford-Fitzgerald, from chartered accountants HW Fisher & Company. Rates are at record low levels in many countries and the ability to borrow a high proportion of the purchase price is easily available. However as Lloyd Hughes from property advisory companyAthena Advisers said: Following Brexit, Brits with a less appealing profile would probably be charged higher interest rates and would have to put down a bigger deposit. "But with British buyers forming such a crucial part of many overseas property markets such as France, Spain and Portugal, banks would most likely not want to mess around with the demand. Miranda John, international manager at SPF Private Clients, agreed: 'Even after Brexit, a Brit would find it easier to get a mortgage to buy property in France than an Estonian, for instance. Overseas estate agents report that Britons are keen to buy in Europe despite the impending referendum, according to A Place in the Sun. Expats may need to apply for a visa to live, work or retire to the EU after Brexit. It is possible that our ability to visit might become more restricted in terms of visa requirements, as well as the ability to work, set up a business, move money around and apply for long term residency in EU countries, said Darren Yates at Carter Jonas estate agents. Peter Esders from Judicare, which specialises in providing overseas property legal services, added: How this would work in practice for those who are already living within the EU nobody seems to know but it would seem sensible that there is a transition period within which they have a certain period of time to apply for a visa to continue living in that country. It seems that in the event of Brexit, expats living in another EU country could face months or even years of uncertainty.